I debated on participating in Bloggiesta but I've always wanted to do it and I really NEED to do it so Bloggiesta it is. 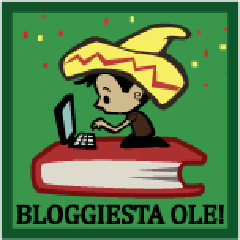 WHAT is Bloggiesta, you ask? Bloggiesta is an event founded by Maw Books Blog and run by It's all About Books and There's a Book, that schedules a Blog Spring cleaning of sorts over a weekend. It's running this weekend, March 22-24. Now you might wonder WHY you want to spend a whole weekend cleaning up your blog. But I think we all know the answer to that. It feels good for things to no longer hang over our heads. Plus, it things are always more fun when shared. During this event there will be mini-challenges, twitter chats, and other bloggers doing the same thing as you. What more could you ask for? I know, I know. But we can eat ice cream while doing this, so we're all set. Update reviews on Goodreads, Amazon, and B&N This hadn't been done since March of last year! I don't expect to complete this list but hopefully I'll see this long list and become extra motivated to make some kind of progress. I'm participating in Bloggiesta as well and you are like me, have lots of goals on your list! Good luck whittling your list down and crossing off to-do's. btw, love your rating system, it's adorable and so cheerful, well except for the yuck face. Thats how I felt after a recent audiobook that started out awesome but ended up yuck. Good luck with accomplishing your goals! It helps relieve the pain after a disappointing read. Trust me on this. Wow! What a list!? I have to look into Bloglovin. And as I was reading your list I realized I forgot a few things. Like update my reviews on Audible. Opps! And you have a blog binder? Do share. Everyone is asking about the blog binder. I'll definitely create a post. As usual, I'm so glad I stalk your blog. I really got a lot done even though it doesn't look like it above. It took me days to get Amazon, Goodreads, and B&N updated. I almost gave up. I was an entire year behind and didn't realize it. There is no way I could have gotten it done any other way. Great list! What's this blog binder you speak of, and where can I get one? Lol. Fantastic blog design, I totally love your matching social media icons. You've got a great list, I actually have creating a blog binder/diary in my list, been wanting to do that for awhile so what a perfect time to start than the Bloggiesta weekend. Have a great Bloggigesta weekend! Thanks! Those are changing soon though. Le Sigh. No one has mentioned them before. Bloggiesta weekend is the perfect weekend to create a binder. I want to know how you end up doing it. Thanks for all the helpful links. I love to get template ideas. Even if I don't use them for my book blog, I often use them to help organize my work life. Thanks so much! You are awesome! Thank you so much for sharing!!! I'm going to go look right away. I tend to make long lists for these events as well. That way I always have options as to what to work on next! I'd be curious to know more about your blog binder, too. I created a blog planner/calendar last time, but am always curious to see how everyone else keeps themselves organized. Here's my Bloggiesta to-do list. Good luck getting things done!!! I'll create a post on the blog binder since everyone is asking. I use it to keep me organized but it also has a super secret purpose that I'll tell you about ;). Great list! I haven't participated since the very first Bloggiesta, but I did manage to put together a small to-do list for this weekend... Nice to stumble across your blog thanks to Bloggiesta, I look forward to reading more of your posts! Here is my Bloggiesta To-Do List. Thanks! I've seen Bloggiesta around but never until it actually got started and I'd always had plans. I'm excited to be able to jump in this time. That's quite the list! I hope all is going well so far! Everything's great. I'm focused and doing what I can when I can. I knew I wouldn't get it all done but I needed to document everything I needed done anyway. I absolutely recommend business cards! They have done me a world of good. Good luck on the rest, and I hope to see you on tomorrow's Twitter chat! I hope you check out my Bloggiesta To Do List or join my mini-challenge about getting involved! I did do the twitter chat! I love that format. I felt so included and it was fun. I'm inspired! Ice cream is always a good idea! I have business cards, too, but am always forgetting to keep them easily at hand. I don't have as much time for Bloggiesta this weekend as I had hoped to, but it's fun to visit new blogs and see what everyone else is up to. I just found you through the Well-Read Redhead's introductory post. It is long but I knew I wouldn't get it all done. After this weekend, I've decided to never get behind again. It was HORRIBLE catching up.